Oxford ragwort is widely naturalised and locally common in both England and Wales. 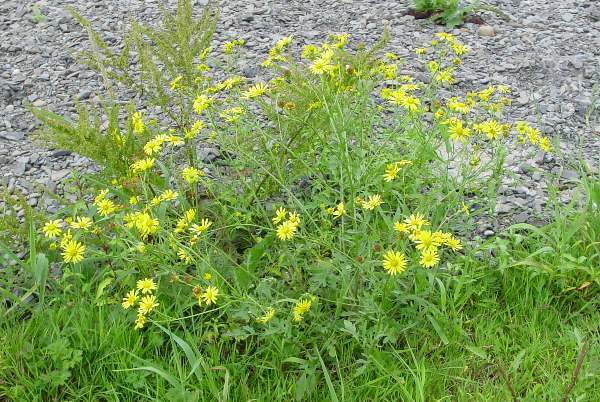 It is an altogether shorter and more stragling plant than Common Ragwort and is frequently found on the sides of railway tracks, roadside verges and on other waste ground as well as in cultivated areas. Growing up to typically 30 cm, the plant has very loose clusters of yellow flowers from April right through until November. Oxford ragwort is actually a hybrid between two ragwort species, Senecio aethnensis and Senecio chrysanthemifolius, that occur in Sicily. This plant was brought from Mount Etna to Oxford Botanic Gardens, in England, in the 1700s, and from there it escaped into the surrounding countryside. An attractive but rather pernicious plant, Oxford ragwort soon spread along railway tracks and can now be found throughout the UK. Ragworts are members of the Daisy family (Asteraceae) and all parts of the plants are poisonous.